Enrollment is currently closed. Please join the waitlist, and you’ll be notified as soon as enrollment opens. Inspire your homeschool with art appreciation and open-ended art projects! The Studio is a monthly membership that introduces you and your kids to a new art history topic each month – and invites kids to explore their own creativity through open-ended hands-on activities! Enrollment is currently closed, but please join the waitlist to be notified as soon as we re-open! And, with a little help, you can confidently and effortlessly introduce your children (of different ages and skill levels) to amazing art each month… even if you don't have a lot of time, a degree in art history, or a fully stocked art room at home! The Studio allows busy (and non-artsy) families to have SO MUCH FUN exploring art together! ... and instead of relying on internet craft projects or other last minute ideas, you offer your kids a glimpse into the fascinating life of an artist from history. You explore the time and place that artist was from. And you invite your kids to create their own art inspired by what you just saw! Art that they come up with on their own... using their imagination and their creativity (not a step by step tutorial). When you join The Studio, this is exactly what you get! Each month you get to explore a different famous artist with your kids, introduce them to important art history ideas, and invite them to create some amazing open ended art of their own... and all of the research is done for you. Each week you get an easy-to-follow guide with all of the info you'll need! You just get to enjoy the fun part– connecting with your kids through creativity! Archived lessons from the past three months! A growing video library featuring demos and tutorials. A private Facebook group where we can connect and chat! Personalized email support from me any time you have questions. The activities are completely adaptable to fit your needs. You can spend as much or as little time on them as you like. It's all up to you and your kids. The Studio works perfectly with your schedule, and is tailor made for your homeschool lifestyle. Access to three months of past lessons. When you join, there will be 3 months of previous activities waiting for you in addition to the current month's topic. Unlock archived bundles. Each month you'll be able to download one of the older lessons from previous months in the membership. We've been studying art for 19 months, so there are lots of fun subjects waiting for you. Personalized feedback from me. Email me any time. I'll usually get back to you the same day. 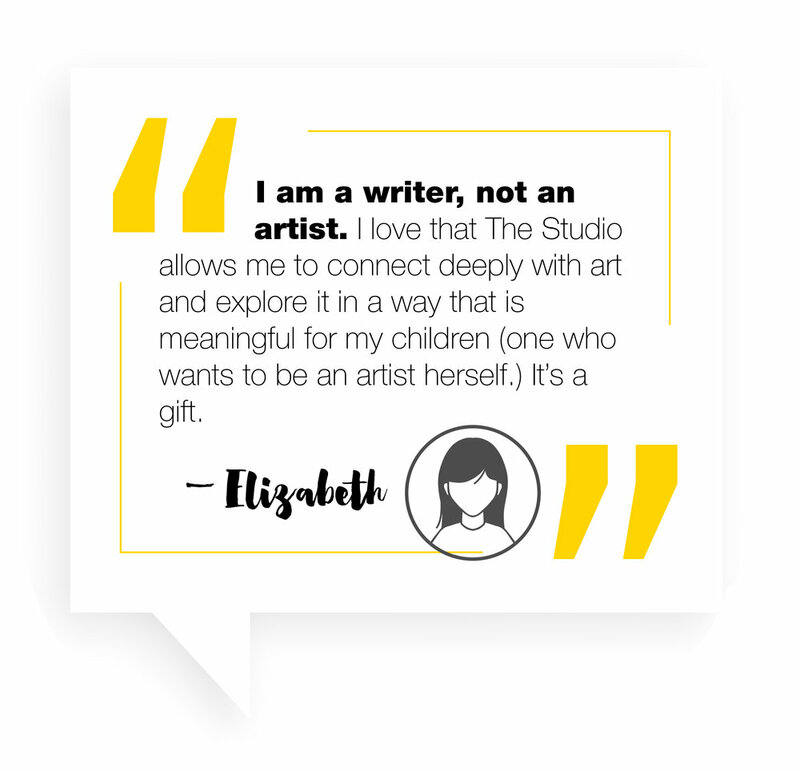 If you've been wanting to explore more meaningful art activities and discussions with your kids... you'll LOVE how easy The Studio makes it! Imagine inviting creativity to take the lead in your homeschool this year! ounder of Art History Kids and a homeschool mom of a 4th grader and a 6th grader.